It all started back in 2008 when an unsuspecting tornado blew through Cabbagetown- one of my favorite areas of Atlanta that's only 2 miles from my own home. It's an historic area with shotgun homes and a wonderful, creative spirit. This 'ol elm tree was one of the many tragedies of the storm, as it was 175 years old. 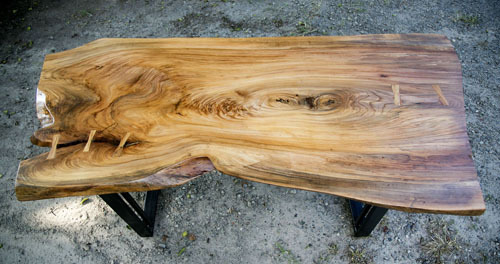 This past May, Clarke purchased two slabs from the salvaged tree that was so rich in history and character. He decided to craft a table. Clarke, "First, I trimmed it to a rough final shape. I built a router sled to surface it which was too big to move around a lot at 4" thick and I didn't want to find a CNC machine. After surfacing the top and bottom, I got it flat on both sides, as it was pretty wavy. Then I started sanding and sanding and more sanding...made some butterfly keys to join the wood, then more sanding. Lastly, I designed and fabricated the legs."